The ship's crew is very busy today, with people getting off and new passengers getting on. We have been trying to just stay out of the way. But before I talk about today, I must describe last night. Our tickets for the opera trip indicated dress was formal, so Ray got into his tux and I pulled out my long black dress, jewelry and multicolored jacket. We met the group in the theater at 5pm and received our bus assignments. There were 3 small, executive buses with about 22 seats each waiting to take us to the Sydney Opera house. Although this would only be about a mile walking, many of the streets in the area are either one-way or blocked off as pedestrian walkways. 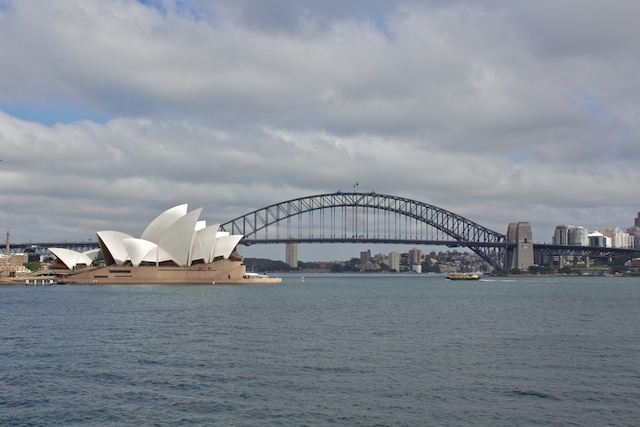 As a result, the buses had to travel a roundabout route through the city to get us to the opera house. 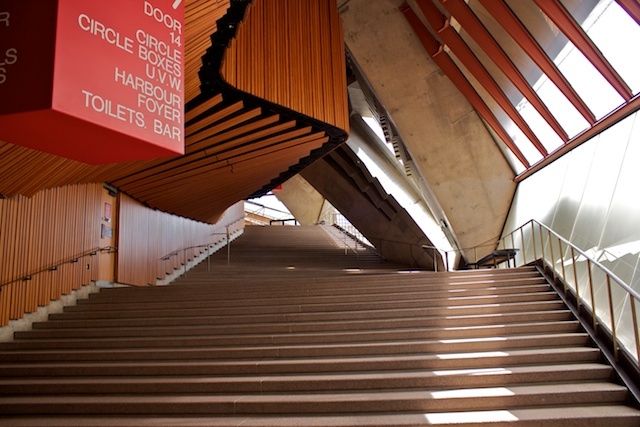 Once we arrived, we were ushered into the Utzon room for a reception. The room is named after the Danish architect who conceived the opera house's design, Jorn Utzon. For the next 2 hours we enjoyed champagne, wine, juices, and various heavy hors d'œuvre. Several of the friends we had made in the pre-cruise activities were there too, so we enjoyed great conversation as well. We made our way to the theater a few minutes before the opera began. It has been a long time since we have been to an opera. It is not usually our favorite type of music, but we did enjoy this one. It was a production of La Boheme, re-imagined with a 1940's Germany setting instead of the original 1840's Paris setting. Although the story line is a little sparse, the singers and orchestra were very good. The English subtitles, although obviously not literal translations of the Italian lyrics, were enough to allow us to follow the story line. After the opera, we made our way downstairs and boarded the buses to return to the ship. The only glitch in the evening involved security getting back on the ship. Australian authorities have everyone go through standard airport screening equipment before boarding. This is usually not a problem coming back from tours, but last night just about every woman set off the buzzer on the body scanner with her jewelry. I was one of them. I had to go through 3 times before I was cleared. After the first try I removed my jewelry, and then before the third try took off my shoes and beaded jacket. The beads must be metal!! At least I wasn't the only one. When we got back to our room, we found sandwiches and cookies waiting for us. Our butler was concerned that we wouldn't have had dinner because we had to leave so early. It was after 10pm, so we declined the sandwiches but did enjoy the cookies. This morning we ordered breakfast in again so we could stay out of the way of departing passengers. We were booking on a 9am tour "Opera House and Bondi," so we needed to be out shortly after the last departing passengers. There are 5 theaters in the opera house, so this tour allowed us to see the Orchestral theater, the opera theater, and one of the small theaters when not in use. We got a full explanation of the buildings of the opera house, with it's many problems, and a good description of how things work preparing for and during performances. After we left the opera house we got a tour of parts of the city, then drove out to see the famous Bondi beach. 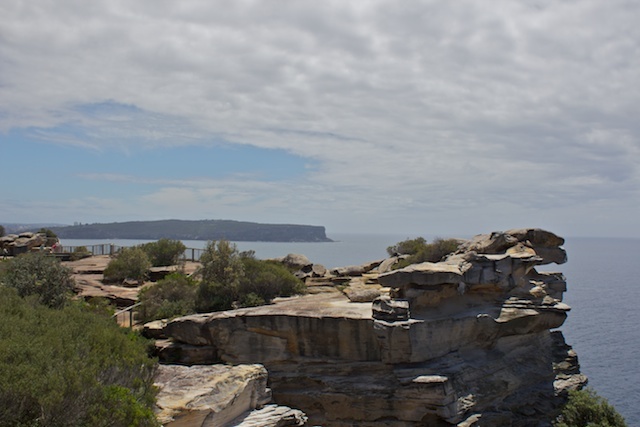 On the way, we stopped at a lookout point for a fantastic view of the bay and the cliffs at the entrance to the bay. 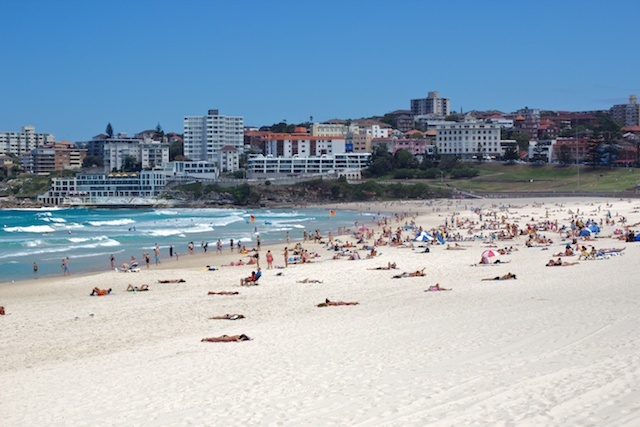 Bondi beach is small compared to what we are used to on the east coast USA, but that is because it is in a cove. It does has beautiful white sand and good surfing. We enjoyed smoothies at the Bondi Pavilion as we watched locals enjoying the beach and waves. Now back on the ship, we are in our room again, trying to stay out of the way of people just coming on board and crew bringing on their luggage. We are going to try to have an early, quick dinner tonight so we can be on our balcony for the sail away from Sydney tonight.